Don't want outside interference and don't want to live within its means. The reasons that PIIGS get away with it and here probably the regions (they have been getting away with it for a couple of years now at least) is imho simply the fact that they can. Apparently first one of them has to be used es an example. Greece is probably a good candidate and likely will go anyway. Seen this however I would let the EZ demands do it on a region. Spain is covered internally, you get the example, fall out problems as small as possible. Providing Greece doesnot go first of course. Everybody has forgotten (including myself) that Catalan are also national taxpayers (and they are the Bavaria of Spain). Although what ever way you look at it their own austerity programm doesnot appear to be very successful. Another point that this is likely putting fuel on the independency wish in Catalunya. Being a substantial nett contributor to the national treasury while at the same time facing cuts by the same doesnot go well together in times of austerity. Earlier I had the idea to further regionalise countries like Italy and Spain. With much more budgetrights and obligations. Could be the closest to an optimal monetary union possible. Within these countries you donot have language problems and as much educationproblems as within the EU/EZ. So when a region does badly, you have less budget (and likely lower social security and lower wages as well). People will move to regions that work (like Catalunya or North of Italy). FTAV had a interesting topic on the regions with amounts btw. ESTO VIENE DE LEJOS. LO QUE HA HECHO LA PROFUNDIDAD DE LA CRISIS EN ESPAÑA ES DESTAPAR DE MANERA UN TANTO DRAMÁTICA ERRORES FUNDAMENTALES EN LA ESTRUCTURACIÓN DEL LLAMADO ESTADO AUTONÓMICO. LO QUE LATE DESDE HACE MUCHO TIEMPO EN ESPAÑA ES UNA INADECUACIÓN DE LA CONSTITUCIÓN POLÍTICA Y DEL SISTEMA DE REPRESENTACIÓN CON LA SOCIEDAD VERDADERAMENTE EXISTENTE. 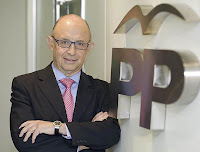 Y LA CORRUPCIÓN, QUE LO CUBRE TODO, COMO LA NIEBLA. I just read this article and surprised to know that there are skirmishes within Spain and the controversies following it. The current scenario being very unfavourable, I think they must settle down with some option to set the market and economy straight.